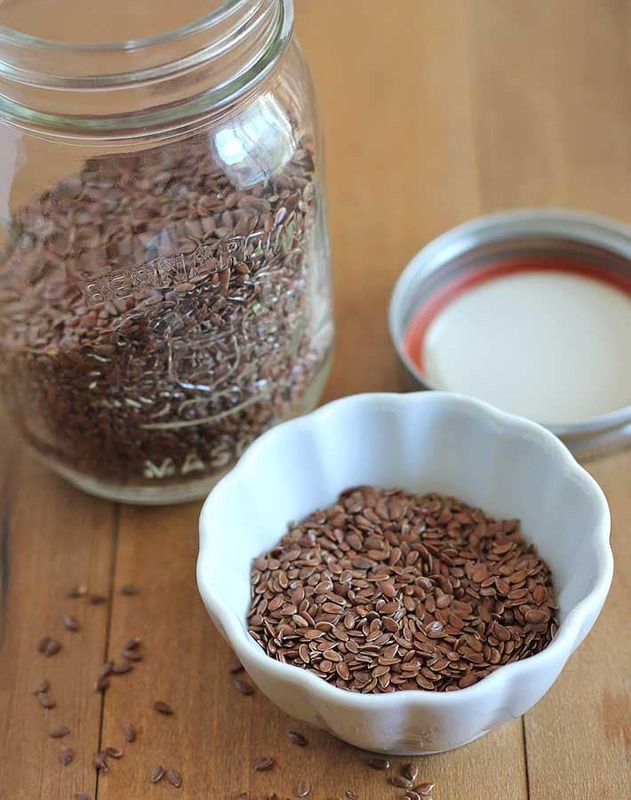 If you need a vegan egg substitute for baking, flax eggs are a great choice. Here’s a step-by-step that will walk you through (and show you!) 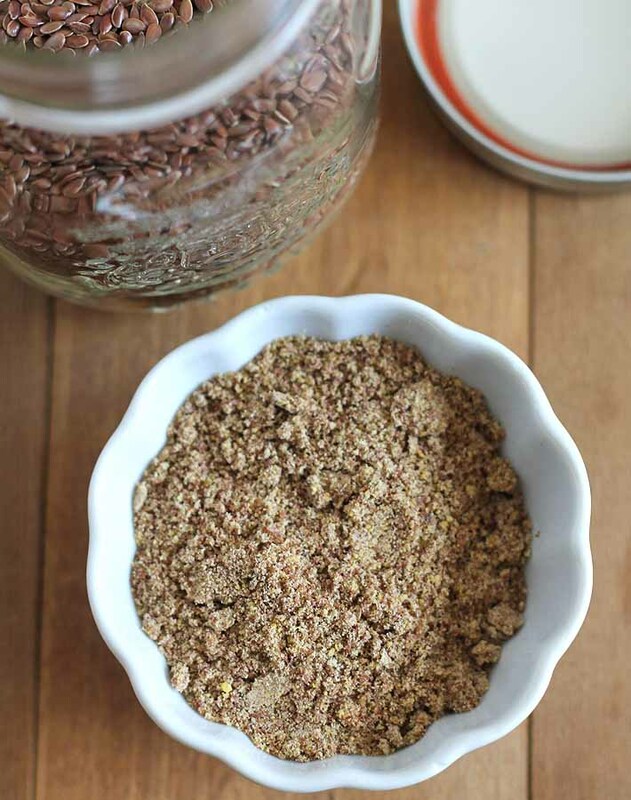 how to make a flax egg, plus I’ll answer all your flax egg questions. 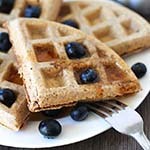 In vegan baking, there are many ways to substitute eggs and my favourite vegan egg substitute for baking is the flax egg. I can’t take credit for coming up with this method, it has been around for a long time, but I’m thankful for it because every baking recipe on this site, to date, includes flax eggs as a vegan egg substitute. I prefer them over the other options because they’re reliable, easy to make, and they leave no taste in most recipes (see more about that below). Learning how to make a flax egg isn’t difficult. All you need to make a substitute for 1 small egg is two ingredients: ground flax seeds and water. There are a few variations when it comes to making them, and one popular way is to whisk and then refrigerate the mixture anywhere from 5-30 minutes. I have never refrigerated my flax eggs and they’ve never failed me, so the method I’m going to show you here is the way I have always made them. Whole or Pre-Ground Flax Seeds…which is best? 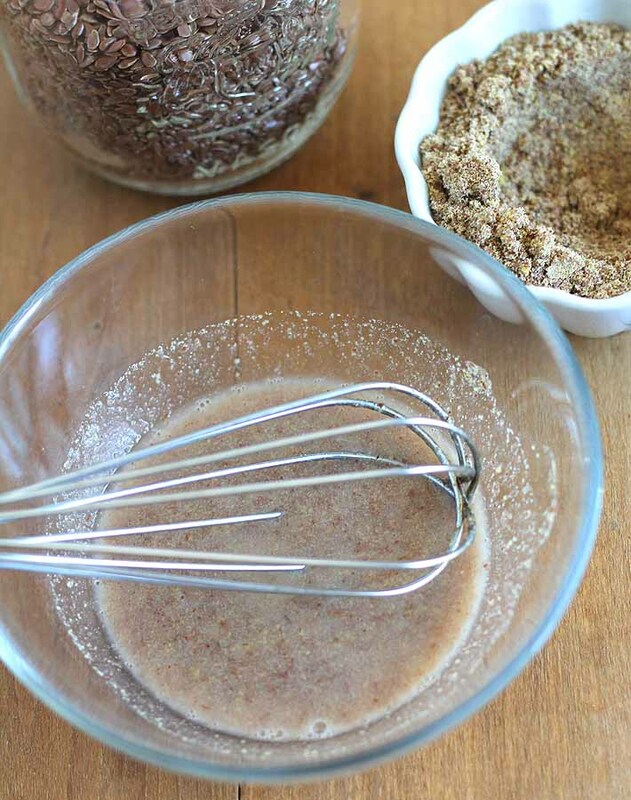 To make flax eggs, you’ll need ground flax seeds. I prefer to buy whole flax seeds and grind when needed. I bake a lot, so I have a small, inexpensive coffee bean grinder that I bought many years ago (similar to this one) and it’s strictly used as my flax seed grinder. If you don’t have a grinder and cannot grind your own flax seeds, that’s OK. You can buy pre-ground flax seeds. If you do buy them pre-ground, note that they have a shorter shelf life than the whole seeds because of the oils released when they’re ground. Keep your ground flax seeds in the refrigerator or freezer so they last as long as possible. Which is Better for Flax Eggs? Brown or Golden Flax Seeds? 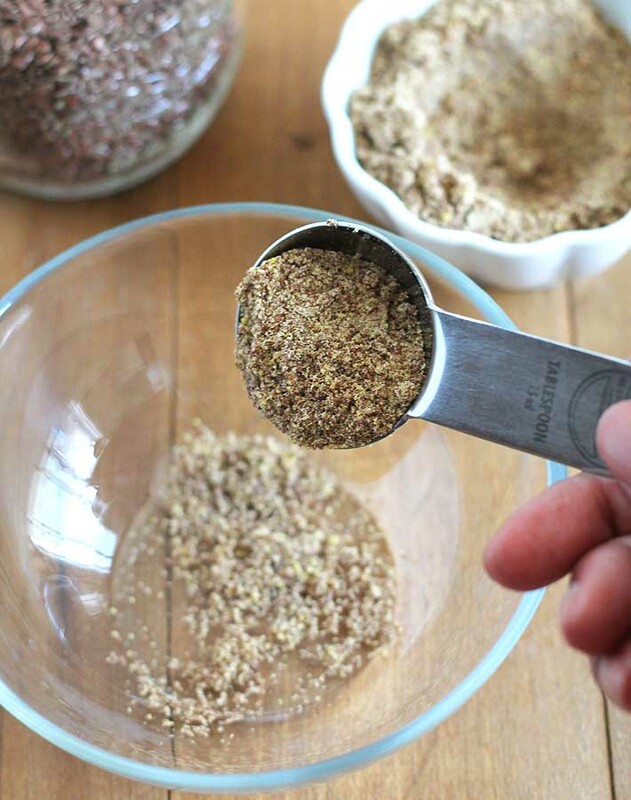 I’ve always used brown flax seeds because they’re easier to find where I live, but you can also use golden flax seeds interchangeably. The only difference between the two, when used for flax eggs, is the appearance (kind of like white vs. brown eggs…same thing, different appearance). I prefer to use golden flax seeds to make my flax eggs in recipes that are lighter in colour to avoid dark spots in the finished recipe. For example, in my vegan baked lemon doughnuts, I use golden flax seeds. A very minor thing, and it makes no difference to the taste or texture, it’s just a preference and totally your call. Once you have your ground flax seeds, you need water. Always add the ground flax seeds to your mixing bowl first and then add the water. 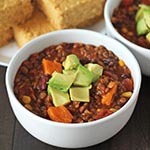 Reversing this order can lead to lumps that aren’t very easy to whisk away. What Does a Flax Egg Look Like? Once you’ve whisked the ground flax seeds and water, the mixture will still be very watery. But once you let it stand for at least 5-10 minutes, it will thicken and get the gelatinous consistency of a regular egg. The longer you let the mixture sit, the thicker it becomes. I’ve let it sit for longer than 10 minutes on a few occasions and they still worked perfectly fine in my recipe. So don’t stress if you pass the 10 minute mark. And you can mix up more than one flax egg at a time, they don’t need to be done separately. Flax eggs are great for vegan baking, but they have their limitations. Obviously, you aren’t going to use a flax egg to whip up meringue, macarons, or scrambled eggs! There are other vegan ingredients you can use to make those things (see my southwest tofu scramble breakfast tacos recipe!). 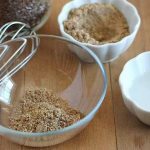 The best use for flax eggs is as a binder to bake up sweet recipes and I also use them as a binder in some savoury recipes, like veggie meatless loaf, veggie burgers, or vegetable fritters. There are times when flax eggs won’t work. One instance is in recipes that call for three or more eggs. I’ve only used flax eggs for recipes that have called for 2 eggs. Know that your recipe may not work out if you’re using it to replace 3 or more eggs. For recipes that are lightly flavoured, a flax egg may not be the best choice. On their own, flax seeds have a light, nutty flavour and in the majority of recipes, you won’t taste them at all. In lightly flavoured recipes, your best bet may be a chia egg, which is made the same way (same measurements of whole or ground chia seeds and water) and has no taste at all. Did you watch it? Learning how to make a flax egg is super easy, right? Here are the recipes shown at the end of that video. They’re perfect to try out your new flax egg making skills! 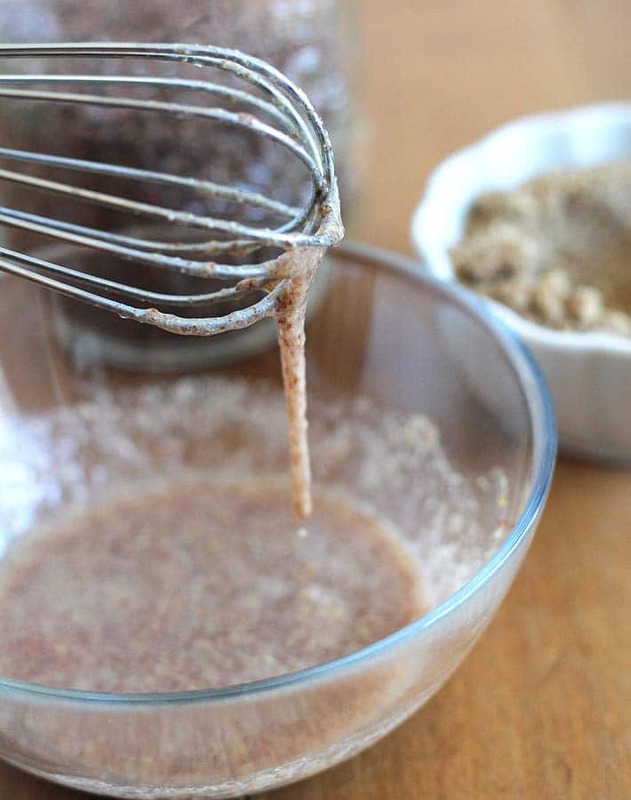 Here's a step-by-step that will walk you through how to make a flax egg for your vegan baking. This recipe will replace one small egg in a recipe. Be sure to read all the info above and the notes below. Add the ground flax seeds to a small bowl, first. With a fork or a whisk, mix for about 1 minute so flax and water are combined and there are no lumps. After 10 minutes, mixture will be this and have the consistency of a regular egg. Whisk again and after that, it's ready for your recipe. Read all of the info above before getting started. This recipe will make one flax egg which is an equal replacement for 1 regular egg. The recipe can be doubled, if needed. Either brown or golden flax seeds can be used to make a flax egg. The only difference between the two is the colour. I like to use golden flax seeds in lighter coloured recipes, like my vegan baked lemon doughnuts. I prefer to buy whole flax seeds and grind them up as I need them because they last longer. Nutrition info is for 1 flax egg, based on the recipe as it is written and is to be used only as a rough guide. Click here to learn how nutrition info is calculated on this website. Hello! 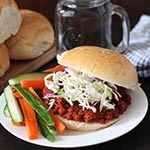 Thank you very much for sharing your recipes. Will you have any recommendations for egg substitute with coconut flour recipes? Thank you for this! I am new to vegan baking and have heard of flax eggs but wasn’t really sure about them. You have convinced me! And the video was great to actually see it being done.